For many years, the cost of obtaining medical records was a barrier for New Yorkers who needed this documentation to apply for Medicare, Medicaid, veterans’ benefits, and other government programs. This prevented many benefits from reaching the people who needed them most. Now, a new bill signed into law by Gov. Andrew Cuomo enables all New Yorkers to access medical records at no charge when they need them to apply for these crucial government benefits. The experienced elder law attorneys at Goldfarb Abrandt Salzman & Kutzin can explain the protections offered by this new law, and how New Yorkers can use it to ensure that nobody illegally limits their rights to these benefits. The new law amends existing provisions of both the New York Mental Hygiene Law and New York State Public Health Law. 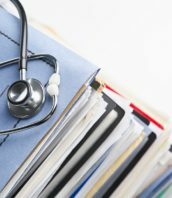 According to WNYLC, the law now prohibits charging a patient for providing, releasing, or delivering copies of medical records when a patient requests them for the purpose of supporting an application, claim, or appeal for any government benefit or program. If the provider maintains the records in electronic format, it may still need to provide paper copies of the records the government program requires paper copies, or if the patient requests them. This law is a common-sense solution to one of the simplest problems facing low-income New Yorkers. To apply for Medicare, Medicaid, and many other government programs, claimants must often submit extensive documentation of their medical conditions and financial eligibility. The significant cost of obtaining copies of the vast amount of documentation required to support a claim can create a financial barrier that many claimants obviously cannot afford. It is, in fact, so significant that many eligible claimants simply do not submit a claim at all. The new law does not remove all of the bureaucratic barriers to obtaining the benefits to which someone is entitled. It does, however, remove one particularly costly barrier. Accessing government benefits is a long and complicated process. It takes time, effort, and expenditures beyond simply obtaining medical records. A potential beneficiary must first submit the appropriate program application to the appropriate federal, state, or local government agency, along with all supporting documentation. Depending on the program, this process can involve many different application components, each requiring extensive records and documentation. The applicant may need to prove financial and medical eligibility, as well as residency and age requirements. If the program denies an initial application, the applicant may then file an administrative appeal. This, too, involves time, effort, and yet more documentation. When a government program approves an initial application, that usually only means the applicant is eligible for benefits. Many programs are now administered by managed care agencies. The program administrator often disputes the extent and duration of coverage. Some programs, such as Medicare, constantly change, and coverage might expand or contract from year to year. This only complicates the process of submitting claims for payment. Medicare uses a detailed and extensive appeals process for denied claims. Other programs employ similar administrative processes for appealing denied claims, reductions on termination of services. While many beneficiaries successfully defend their claims and overturn claim denials, this can prove an arduous task. It requires an understanding of the procedures involved with a claims appeal. It also requires a substantive understanding of Medicare and Medicaid laws, coverage regulations, and standards of review. Government programs provide life-sustaining financial support for many of New York’s most vulnerable citizens. Unfortunately, the bureaucracy, paperwork, and other “red tape” associated with accessing these benefits precludes many eligible recipients from claiming the benefits to which they are legally entitled. A New York elder law attorney can help senior citizens protect their right to government benefits at each and every step of the benefits process. By having an experienced attorney help determine eligibility and review application materials, an application can face fewer questions and processing delays by the agency. This can help the applicant receive access to necessary benefits sooner. Once an applicant has been found eligible for program benefits, an attorney can help navigate the challenging process of appealing claims which have been denied. Each program has its own internal administrative process for handling appeals of denied claims. The appropriate appeal procedure will depend on the specific circumstances of the claim. The nature of the claim, the administrative process, and other considerations may all determine the appropriate response to a denied claim. An attorney can help claimants navigate these difficult questions. Sometimes, a systemic decision within the program administration leads to an entire series of claims being improperly denied. In the case of federal programs, such as Medicare, such denials can affect thousands of beneficiaries across all fifty states. This is why it is so important for senior citizens to stay informed about their right to benefits through Medicare, Medicaid, and other government programs. A New York elder law attorney can help review your particular circumstances to determine whether you have access to all government benefits to which you are legally entitled. Many senior citizens rely on the benefits provided by Social Security income, Medicare, Medicaid, and other government programs. Despite the difficulty many eligible seniors have in accessing these benefits, they must protect their legal rights. The elder law attorneys at Goldfarb Abrandt Salzman & Kutzin have decades of experience in helping senior citizens access all of the benefits for which they are eligible. We also assist with appeals to protect senior citizens from government bureaucracies that deny their legal rights. Call (212) 387-8400 today to schedule your consultation.